1/2 Set RUBBER ELASTOMER SUSPENSIONS (CUSHIONS) – Skates U.S.
Pricing is for One Half (1/2) Set or Four Suspensions. 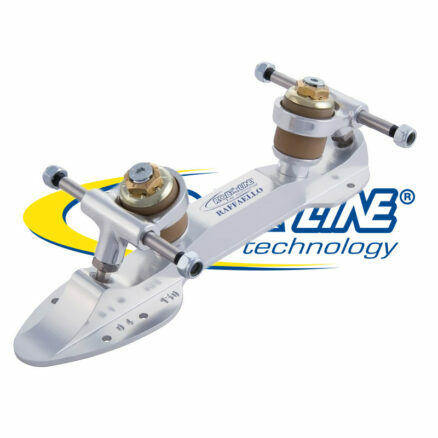 The Roll-Line Suspensions from SkatesUS.com , provides athletes the proper support of the skating shoe and give the most sensitive control, the greatest and absolute fastest response available from any skate, providing a sense of great stability and action. 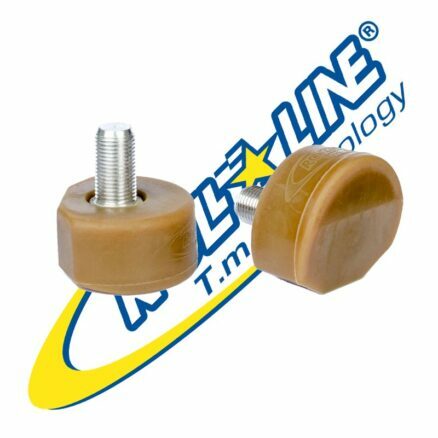 The Roll-Line Natural Rubber Suspensions are available in three (3) hardnesses and Urethane Suspensions are available in five (5) hardnesses to provide 64 choices for the perfect skate alignment and control. The Upper (Large) Suspension provides the Stability of the Edge, while the Lower (Small) Suspension creates the Deep Edges, Great Turns, Spins, and Loops. 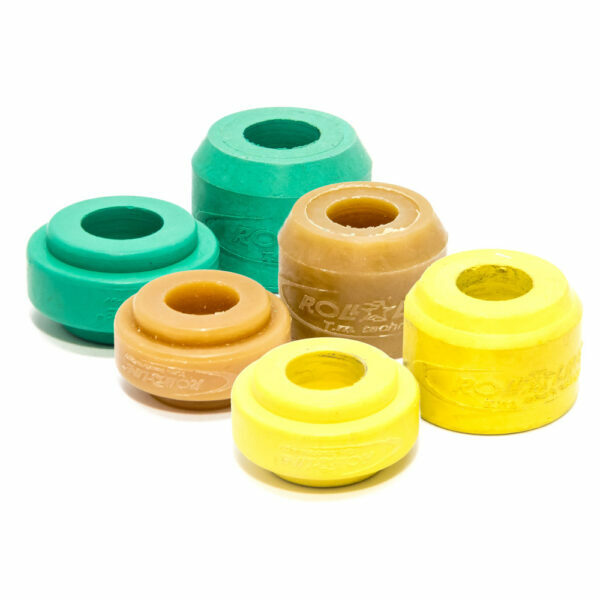 The Suspensions can be mixed and matched in both Rubber and Urethane and in Hardnesses to provide a VERY Custom skate Action, based on your weight, height, and type of Skating that you are doing. Call the experts at SkatesUS.com to discuss the best options for you. Usually the Upper (Large) Suspension is harder, because it is carrying the weight of the Skater, and provides the edge stability, while the Lower (Small) Suspension is often one (1) or (more infrequently) two (2) levels more flexible, providing great edges and changes. For LOOPS it is sometimes suggested to use an appropriate Flexible Upper (Large) Suspension, considering the Skaters height and weight and the small diameter Loops being Skated, with the Lower (Small) Suspension configured two (2) levels Harder. This configuration provides a skate that reacts and feels like the old and no longer available Hodura skate. The list below is an integrated List from the Most Flexible to Hardest and combines both Rubber and Urethane Suspensions. Urethane – Longer Life, Temperatures have much less effect on Urethane, More Expensive. If a Complete Set of one Color and Hardness are desired, please choose that Item. 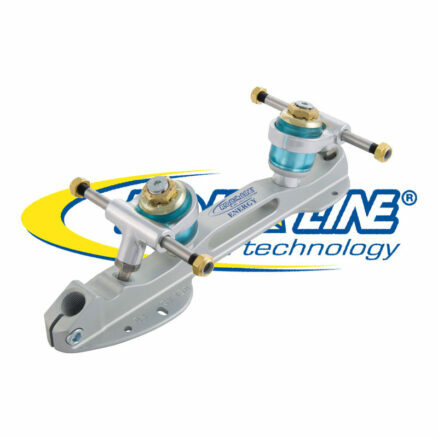 The Hardness of Suspensions that are delivered on the Skate Frames are determined by the Roll-Line factory in Italy. They are based on the size of the Frame, and the expected height and weight of the Skater. If other combinations are desired, they are available for purchase from SkatesUS.com .